Let’s start with “calligraffiti.” There are quite a few artists who do it now. Did you coin the term? No, to be honest with you, this is a term that has been used the first time in New York for a show, I think in ’84. A show created by Jeffrey Deitch for some calligraphy artists and some graffiti artists from New York. 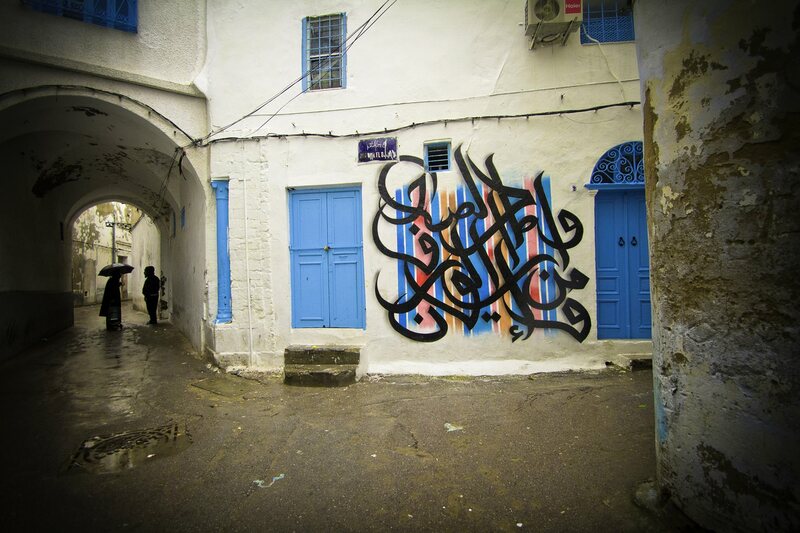 He had this vision 30 years ago that calligraphy and graffiti would merge together. To be honest with you, me today, I don’t even use this word to define myself. I’m just using calligraphy in my artwork. I do sculpture, I do canvases, I do art installations. I’m trying to get out of the box that I think I used to be in a few years ago. What were you doing before your art became popular, and how has your work evolved? I have been painting since I was a kid, and my dream back in the day was to be an animator. I know by heart The Lion King, Aladdin, in French, because I used to rewind all of the time and compose every picture in the movie so I could understand how they make animation. I was born and raised in France from Tunisian parents, and I did not read and write Arabic until I was 18. For me it was a quest of identity. I discovered my Arabic roots and embraced the Arabic culture. At some point I stopped painting, and I studied business. I used to have a nine-to-five job that was a bit boring. When I was doing this job, I said that my soul was dying inside. So I decided to go back to painting. I started learning to read and write Arabic, but I couldn’t find any teacher to teach me calligraphy. I decided to just reproduce some old calligraphy. I started extending my letters and twisting them and, without noticing it, I created my own kind of calligraphy. I used to paint small walls, and then the small walls, they became a bit bigger and bigger. Social media helped me so much. I started posting my stuff online just for friends and family to see what I was doing. Step by step, people started telling me, “Oh, I love what you do.” Then people started gaining interest that I would never have expected. Top: In 2012 eL Seed partnered with French designer Louis Vuitton to create this calligraffiti scarf that referencesa poem about Venice by Taha Muhammad Ali, which eL Seed chose because it “would connect to the story of Louis Vuitton and also the story that I enjoy telling of the Arabs and Muslims and their influence in the world.” Middle: In 2014 Dubai’s Tashkeel Hub hosted eL Seed’s first three-dimensional calligraffiti exhibit, “Declaration.” Lower: eL Seed’s six-story painting on the Arab World Institute, in Paris, which took him a week to create. “Love is the miracle of civilizations” is the translation of a quote from 19th-century French writer Stendhal. “For me, it summarizes the spirit of the institute, which is to bring cultures closer,” says eL Seed. What is your process for making large-scale works? I always try to find a way to go beyond what I’m capable of doing. You need the idea and an artistic challenge. I did this project called “Perception,” which was a painting on city buildings in the Cairo garbage collectors’ neighborhood. I went there without knowing who those people are. I had this small idea about them; that is, they were living in the garbage. And soon I saw that they are not living in the garbage, but they are living from the garbage. That’s why the piece is called “Perception”—because they are associated with trash, and everybody throws them away. The piece is over 50 buildings, so you need to have authorization of 50 persons to let you paint their houses. I wanted to convince each person [but it was] the priest [who] managed to convince them, and he opened the door of the neighborhood. We took a picture of the neighborhood, and then I drew the art on some paper that we digitalized. I zoomed in and used every brick—everything I could find—to help me trace my calligraphy. I needed to make sure the first wall matched with the one that was behind it. [But] normally when I do a bigger piece, there is no sketch. It’s like I know I’m going to make the shape of the circle, and I just trace it on the spot. 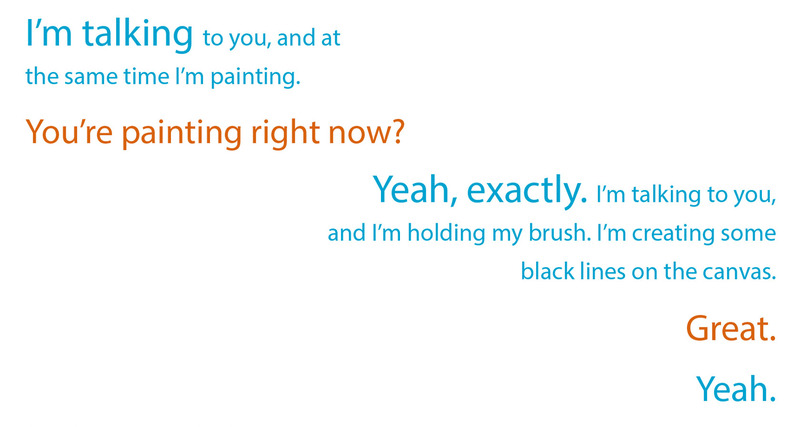 You speak French and English too, so why paint only in Arabic? It speaks to us before it even reaches your eyes. For me it’s like music. Sometimes you hear music in a language that you don’t understand, but you love the feeling of it. You have no idea what the guy’s singing in the song, but you just love it because it speaks to your soul. It was Arabic calligraphy made me accept my French identity, and I realized that Arabic calligraphy placed this bridge between my two identities that I had totally separated. Today I want to use this to create those bridges between people and culture and generations. So, in Houston I was like, “Okay, I need to make something that connects the people to the artist.” I cannot just go and write some Arabic poetry on the wall. So that’s why I chose this quote from Sam Houston that says, “Oh my son, knowledge is the food of genius, and chase it wherever you are.” Something like that. We need to create bridges between people. When we create bridges between cultures, you open a dialogue between them. People often ask me, “What do you love the most about what you do?” What I’ve realized is that setting up the piece is good, I enjoy painting, but all my pieces at some time will be left here, and the only thing that stays inside is this kind of human experience, meeting people. I think this is what I love the most. Leaving this kind of mark into people’s lives because actually so many people leave marks in my life as well. Now you are doing sculpture, too, and you have worked with the designer Louis Vuitton. Yes, Louis actually was a few years ago. They asked me to design one of their scarves. Knowing the history of Louis Vuitton’s collaboration with artists, for me it was such a huge honor. Being born and raised in France, it was obvious, so I said yes. Now I work a lot more on sculpture, mostly small pieces. My plan is really to work on big sculpture in the public space. Sometimes it’s difficult, but if you like the process of making stuff, it is just amazing. 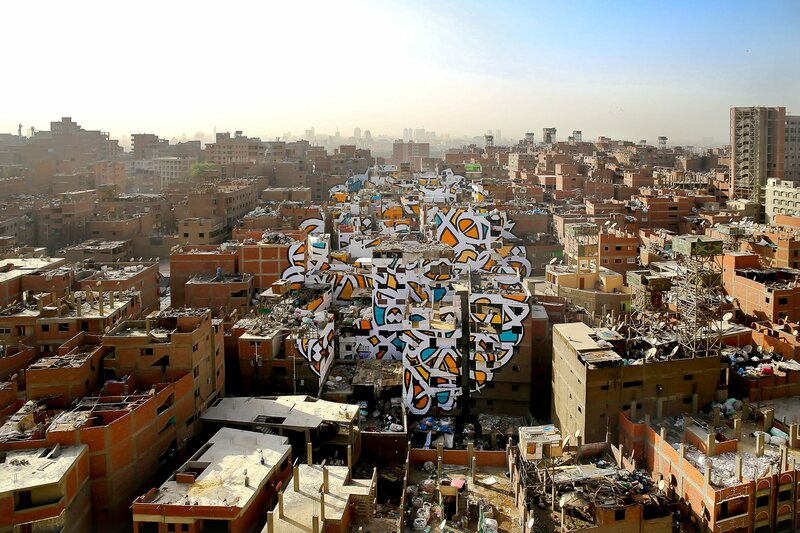 In his most complex calligraffiti project to date, eL Seed spent much of 2016 painting more than 50 buildings in Cairo to create “Perception.” It translates: “Anyone who wants to see the sunlight clearly must first wipe his eyes”—words visible in full only from a single vantage point. You mentioned building bridges. So tell us more about why that’s important to you. I feel we’re in a time today where everything is made for people to ignore each other, to reject each other, to condemn each other. Then we have no idea of who we are. Do you know what I mean? You base a full opinion on something that you’ve seen five minutes of on the media, and you never dig deeper to know people. You never try to make a step towards people. I know there’s so many stereotypes with Arabic script. I’m attached to it, and now I’m trying with my art to show a different image and show actually we are connected together. We should embrace our differences. For me, that’s the only way to go. That’s how you become tolerant, and your mind opens as well. I truly try to achieve that with my work. How do you want to be defined or known? Just as an artist who tried to make people dream—who dreamt big enough so people can dream again.